Are you tired of carrying around a bulky charger or tangle-prone USB cables just to charge your iPhone? It used to be that you had to settle for either the charger or the cable (and their shortcomings, as well) to keep an iPhone going throughout the day. Now, users are no longer left with such a limited set of choices. Why? 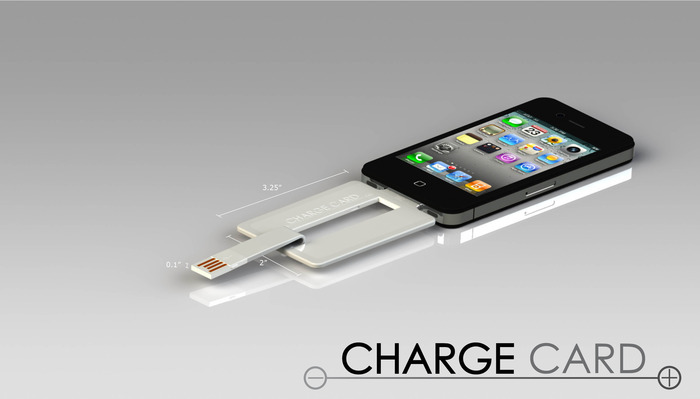 A new kind of iPhone charging cable called the ChargeCard is being promoted in Kickstarter. The ChargeCard may be the most portable and discreet charging cable yet; it is, after all, a cable about the size of a credit card and designed to fit into your wallet for ultimate portability. The brainchild of inventors Noah Dentzel and Adam Miller, the ChargeCard is a 30-pin rigid USB charging cable folded into itself. Such design is what allows the “charging card” to be tucked away into a card slot in your wallet yet transform into an iPhone charging cable with a flip. The body of the ChargeCard is made out of ABS plastic to ensure durability. The USB arm/connector that flips out of the card is made out of a flexible thermoplastic elastomer. Measuring a tenth of an inch wide (2.54 mm), the device is about three times as thick as a credit card. Considering that this is an iPhone charging cable we’re talking about, that is quite impressive. The ChargeCard works by unfolding from its card form to reveal the connector arm that can be plugged into any USB port. So aside from being extremely portable, the ChargeCard is also versatile, drawing power for your iPhone whether it’s connected to a laptop, a TV, or a game console. There is one downside to the ChargeCard. It’s not the most practical device to use with a USB wall charger, since its length is lacking. But it’s a minor inconvenience once the ChargeCard’s features are taken entirely into account. As of now, the ChargeCard does not yet have a scheduled market release but astoundingly, it has already raised almost double the funds it aimed for. With around 30 days to go, it has already reached more than $90,000 while it only aimed for $50,000. It is already backed up by more than 3,000 people, and still growing! The ChargeCard will be formally funded by Kickstarter at end of August. Buyers can choose from black, white or blue/brown combo, and can even have their name (or anything you want) engraved on the card. Now that’s exciting! This entry was posted in Apple, Articles, iPhone, USB Charger, USB Devices, USB Gadgets and tagged Adam Miller, Charge Card, ChargeCard for iPhone, iPhone charging cable, Noah Dentzel. Bookmark the permalink.